I found the entire experience, from ordering through completion of the repairs to be flawless. The package arrived in good time, the instructions were complete and easy to follow, and the results were better than expected. My JBLs sound as good as new, at a fraction of the cost of replacing them. The foam speaker repair kit went off without a hitch. The instructions were easy to follow. 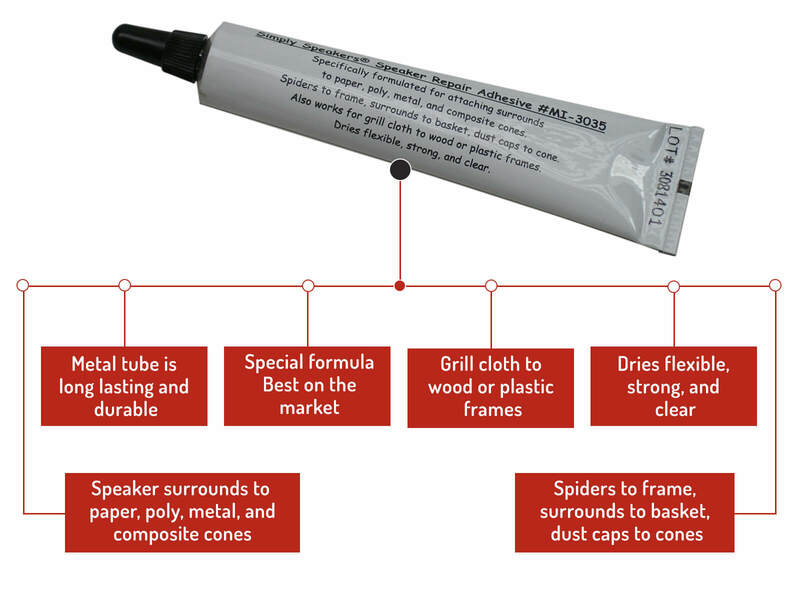 Use the glue sparingly to avoid 'working' the foam. I've had several speakers refoamed in the past and have even replaced expensive drivers when the foam surround has failed. Your kit instructions are well written and not only simplified the procedure, it made it fun. As an engineer, I appreciate the value of clearly defined actions in step by step directions. Highly recommended for those who can change a light switch or fix a leaky faucet. 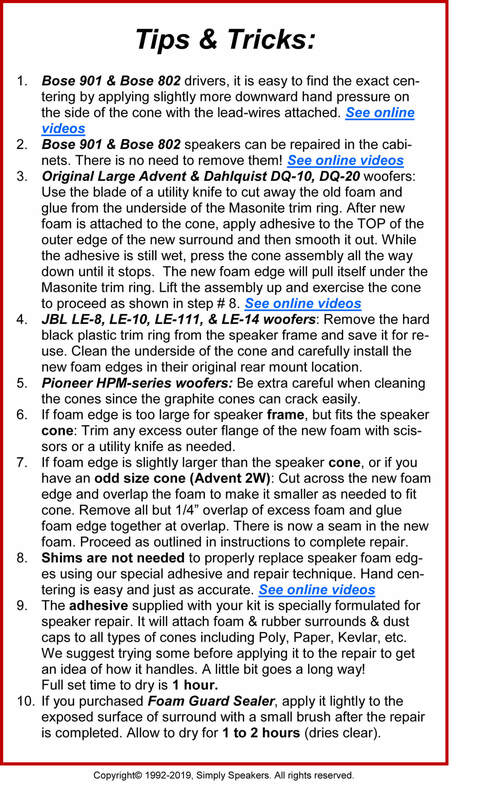 This was my second set of speakers I have refoamed......instructions are very easy to follow, and I would highly recommend Simply Speakers....great repair and speakers sound brand new!!!!! This kit was easy to use and now my speakers sound as good as new. 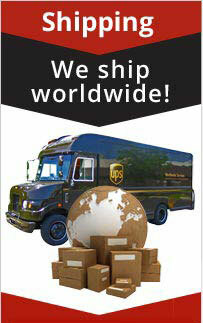 I'm very happy with this product and your service. The kit was straightforward to use, way less expensive than replacing a woofer or complete speaker, and your tech staff was helpful when I called to ask a "first timer" question. I bought a set of JBL MR speakers that are solid performers. The foam on all of the midranges were moderately decayed. I used this kit to restore the speakers to like-new condition. 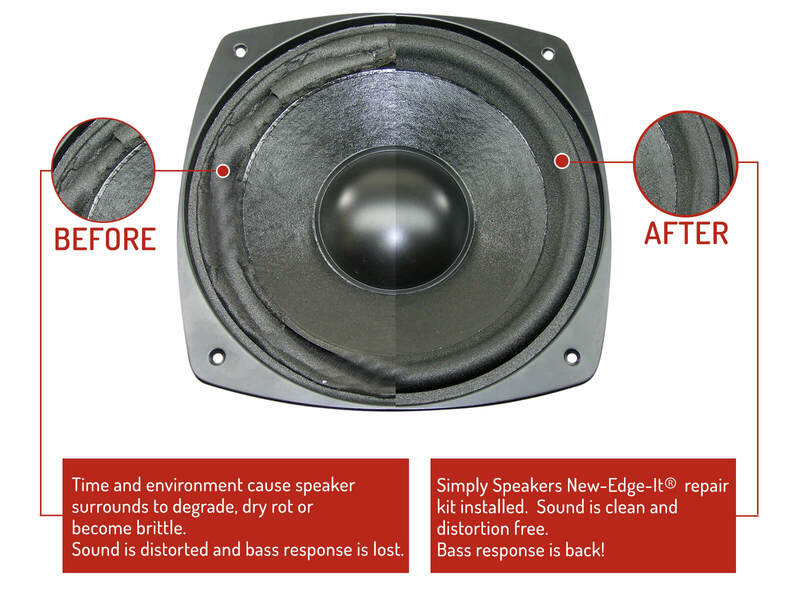 There is a slight learning curve with application of the adhesive and how it affects the replacement speaker foam. 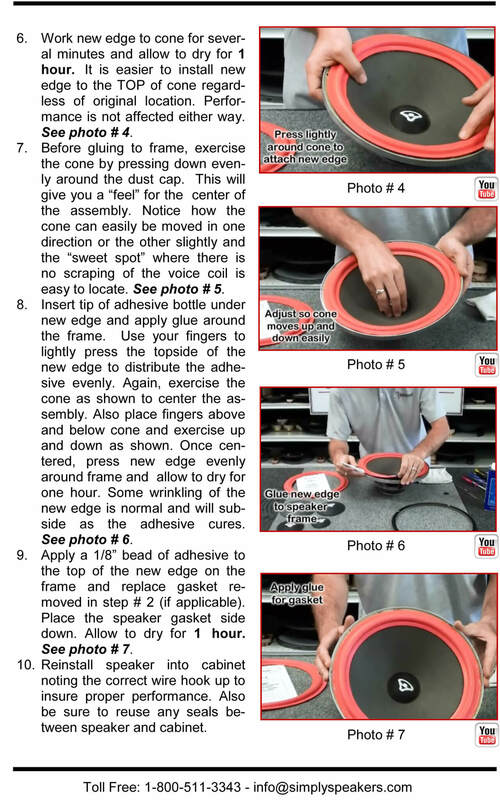 It's important to note that the glued foam will have to be lightly worked back into contact with the metal flange or speaker cone until it bonds with the surface. Overall an excellent solution. I would like to say, The serves was great and the repair kit its self was perfect and easy to do. I now have my speakers bake in perfect working order. Thank you Simply Speakers! The kit worked perfectly. I originally ordered it wrong. Simply Speakers sent the correct order immediately upon my return of the wrong ones. It felt like old-fashioned service. Just like the good old days. Thanks folks! 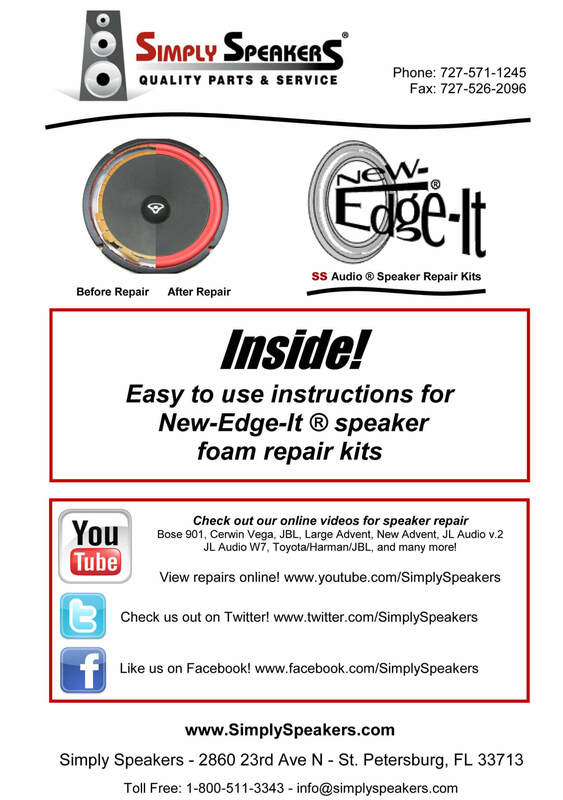 Q: I need a Foam speaker repair kit for a 2005 Toyota Sequoia. Can't find my speaker model number on your site. 6.5" 86160-AF070. other numbers on back of our speaker include 6848-AB also, 01305-F0121. Would like to use your product. Please help me out as to what kit to buy. ? 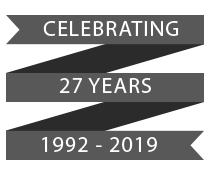 Q: o.k for LX 22 ? A: Yes, this kit will fit the JBL LX22 and our FSK-6.5 also works fine on your model. Q: This product will fit JBL xTi 20 driver A2106A-L? A: Yes! This kit fits the JBL European model XTi 20. Q: Does this work for JBL2600 6.5" speaker? A: Yes, this repair kit will fix the foam edge woofer versions of the JBL 2600. 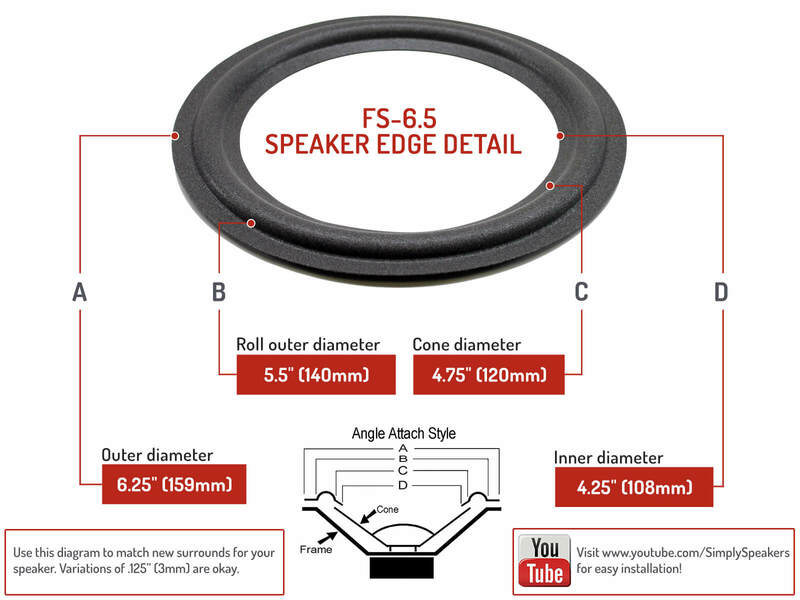 A: Please order kit # JBL-FSK-6P206 for your JBL model LX2004. A: Yes, the JBL-FSK-6.5 kits work on your model. The rubber trim must be removed and reinstalled after repair. A: Yes, this is the correct kit for your JBL 115H woofer model. 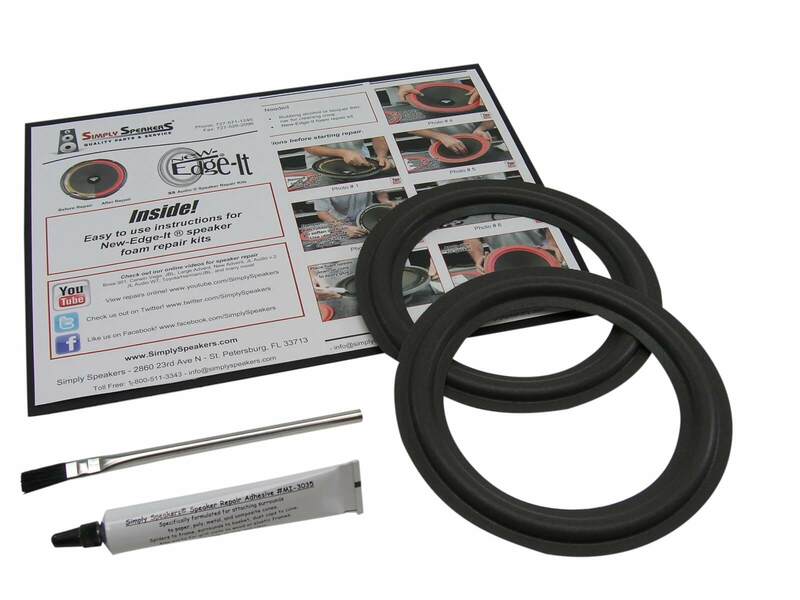 We also sell a new style rubber kit (like the original). Part # RSK-6.5. Q: Will this product fit the JBL LX600 speaker model 410G-1? A: Sorry, no. 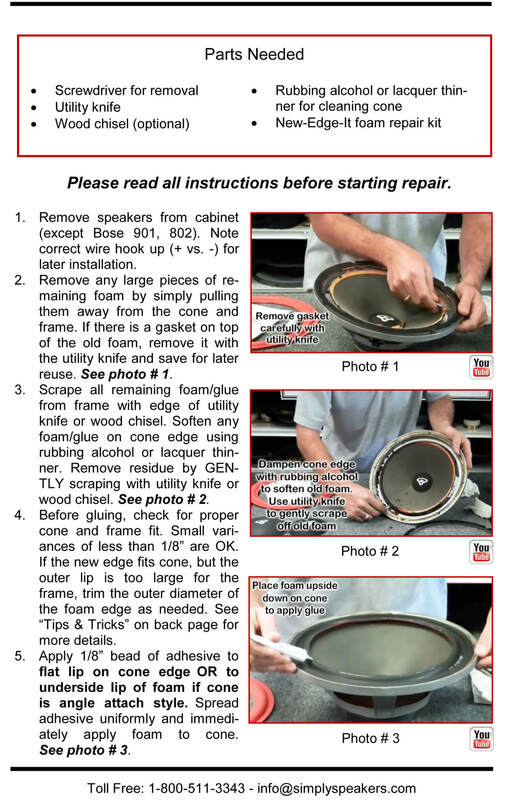 For your model, please order our 10" woofer repair kit part # JBL-FSK-10A. JBL: 4206, 4401, 4406, 39-0057 F37F18C804DA, 115H, 115H-1, 115H1, 18TI, 206HS, 406G, 4206, 4406, 506G-2S, 506G2S, 706G-1, 706G1, C608 GTI, Control 5, CM 62, HP420, HP520, HLS610, J216, J216A, JBL2600, JBL62, JBL62T, JBL630, JBL630T, L1, L15, L20T, L20T3, LX-22, LX22, LX-300, LX300, LXE-330, LX330, LX-700, LX700, P20, PS-60, PS60, P-60, P60, PRO VIII, S2C, S2M L/R, S3HC, S3M, S3VC, S4, SVA-1600, SVA1600, Ti-600, Ti600, TLX-12, TLX12, XPL 200, XPL200, XPL-200A, XPL200A, XPL90A, XTi-20, XTi20, XTi-40, XTi40, XTi-60, XTi60, XTi-80, XTi80, and many more!